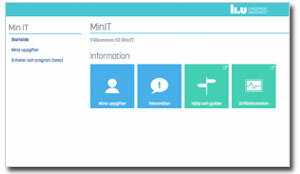 Min IT is a new portal for IT self-service. Biographical descriptions for the new LiU Web are also handled here. The new LiU web uses “Min IT” to retrieve biographical descriptions that will be used on the employee pages. Everyone must log in themselves to “Min IT” and consent to the biography being used; the description will then be brought into the Sitecore web publishing tool and into other IT systems such as Lisam. “This is to be regarded as personal information, and its use must be approved by each employee,” explains Sussanne A. Larsson of the Website Management Unit. The departments themselves ordered and paid for the photographs of the employees for the new employee page. They therefore decide on the use. The ambition is for all employees to be listed with pictures, but naturally no one can be forced to. For the units or departments that hired external or internal photographers to take the portrait pictures, these will be brought into “Min IT” in large clusters. The Web editor at the respective units or departments will notify the employees when the pictures are in there, and can thereby be approved by the individual employees. It is up to each unit or department that paid for the photography themselves to determine whether employees who wish to use their pictures privately may do so. There will be additional opportunities to book our external photographer over the spring. Times for these will be announced to the Web editors. Among others, the entire University administration will be asked in for photographing.